Not so fast, imports: Cadillac's new 2016 CTS-V is a car that aims to show America's still number one at building muscle. Cadillac has unveiled the 2016 CTS-V sedan, a car that it will take aim at European manufacturers and attempt to inject a market dominated by Germans with a little American muscle. Cadillac introduced the world to the CTS-V, which will set you back close to $100,000, at Road America deep in Wisconsin.Road America features a 4-mile track that lets the company show off just what the car can do, according to a Wall Street Journal. The Journal’s reviewer described the car as everything you’d expect from a car aiming to be quintessentially American: big and fast. It has its drawbacks, one of the main ones being that it is fairly heavy and has a sort of garish Trump-esque flair. But the reviewer was impressed with the 2016 CTS’ upgraded responsive processor in the CUE system touch screen, which appears to be a much better version compared to past dashboards. In addition, the car is roomier, meaning that weight was not wasted. And then there’s the engine: it is 6.2-liter direct injection, it has a two-valve V8 that can produce a whopping 640 horse power, and it can get up to 6,400 RPMs. It’s a car that can hit speeds in the area of 200 miles per hour. The CTS-V also has a lot of torque, but even placed into some hair-raising turns at high speeds, the reviewer said that it appeared to be fairly graceful even when buffeted by bad pavement. 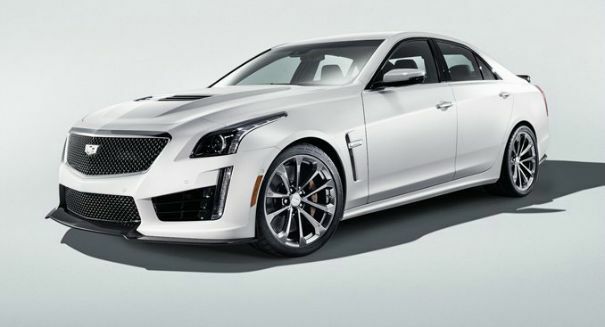 But can the CTS-V compete with the real heavyweights of the luxury sedan world, like the BMW 5 Series, the Lexus GS 350, or the Mercedes-Bench E Class? It may be tough, but with the Cadillac’s reputation as a high-end luxury sedan firmly in place and with an engine that can get it to 60 miles per hour in just 4.5 seconds, it may turn some of the right heads in a very competitive market.